All spoilers regarding the Skywalker Saga, The Clone Wars and Rogue One are unmarked. Examples relating to Disney's EU and the new movies can be spoiler-tagged if deemed necessary. The Rebel fleet was formed from the vessels of various rebel cells joining together as the Alliance was officially formed. Early on, the fleet relied on modified freighters and other smaller craft, with larger ships being donated by sympathetic planetary defense forces or stolen from the Empire. However, at hidden shipyards the backbone of the Alliance Navy was constructed as Mon Calamari engineers converted their city ships into massive vessels of war that could go toe-to-toe with Imperial Star Destroyers. After the establishment of the New Republic, new classes of vessels entered into service from captured Imperial shipyards, although the size of the navy was significantly downsized following the signing of the Galactic Concordance. the war is just beginning." A Mon Calamari war veteran who helped lead the defense of his homeworld during the Clone Wars. He becomes a key member of the Rebel Alliance military, commanding the Rebel fleet in the war against the Empire. Ackbar retired following the end of the Galactic Civil War but returned to active service as one of the founding members of the Resistance. All There in the Manual: His first name from Legends is reestablished in the Canon via the sourcebook Absolutely Everything You Need to Know. Ascended Extra: He gets significantly more attention in the Canon than his small yet memorable role in Return of the Jedi. Most notable is his appearance in The Clone Wars, where the younger Captain Ackbar acts as a military advisor to his people's young prince. Badass Normal: The Clone Wars reveals that back when he was Captain of the Mon Calamari army, he was no slouch in a direct fight. Age may have caught up to him by the time he became a Rebel fleet admiral. The Captain: He was a literal captain of the Mon Calamari defense force in The Clone Wars. He also acts as this for the Rebel fleet in Return of the Jedi by leading the assault on the Death Star II. Captain Obvious: When the Rebels are led into an Imperial ambush during the Battle of Endor, Ackbar makes one of the most profound observations in the Star Wars saga: "It's a trap!" Cool Starship: The Mon Calamari star cruisers, including Ackbar's flagship Home One, stand out among the rest of the Rebel and Imperial ships for their smooth, ovular shape. Deadpan Snarker: More obvious in his commentary towards other officers in Rebel Files. Statura: (about Dornean gunships) A gem among the smaller capital ships. Who still uses these? Ackbar: Dornea, my dear Statura. Dornea still uses them. Poe: (about how the Alliance would deploy squadrons with different types of starfighters) Not a fan of mixed-design squadrons. But I'm not here to tell the admiral his business. Ackbar: No, you are not, Lieutenant. Dropped a Bridge on Him: He, alongside the rest of the Resistance's leadership, is killed in one blow by TIE fighters firing torpedoes during the escape attempt from the First Order in The Last Jedi. This is possibly due to Erik Bauersfeld's death early in the film's production. Despite ordering all fire concentrated on the Super Star Destroyer Executor, once it is destroyed, Ackbar merely slumps back in his chair, appalled at all the senseless deaths. Heir to the Jedi reveals that he dislikes smugglers and smuggling, even though the Alliance often has to rely on sympathetic smuggler organizations for supplies. Fish People: His species, the Mon Calamari, are fish-like Humanoid Aliens. Four-Star Badass: He is the Alliance/New Republic's best fleet commander, and besides his considerable strategic talent he also stays in pretty good physical shape despite his advancing age just in case he ever needs to personally get into a fight. Frontline General: He was a Frontline Captain back in The Clone Wars and engaged in direct combat even before he became a fleet admiral for the Rebel Alliance. He demonstrated this as he leads the Rebel Fleet against the second Death Star in Return of the Jedi. Guttural Growler: He speaks with a raspy, authoritative tone. Large Ham: He is a bit of one in the film, but his appearance in Princess Leia is mostly him shouting hilarious lines during the evacuation of Yavin. Ackbar: You! Soldier! Stop dropping things! Being cursed with human hands is no excuse for clumsiness! Children. You're all children. Old Soldier: His exact age is unknown, but he was already elderly by the end of the Galactic Civil War. Ackbar is in fact the only known being who has fought in the Clone Wars, Galactic Civil War, and the war against the First Order. He counters the ill-effects of age by practicing his martial skills against holographic opponents. Rank Up: Following the Battle of Endor, Ackbar is promoted to Fleet Admiral of the New Republic Navy. He retains the rank as a member of the Resistance. Reasonable Authority Figure: Out of the Alliance's leaders post-Scarif, Ackbar is the one who sides with Luke, Leia, and Han the most often and provides them with whatever support they need with few questions asked. Retired Badass: Following the signing of the Galactic Concordance, Ackbar retired from active service. A few decades later, Leia managed to convince him to come out of retirement and join the Resistance to combat the First Order. Screw the Rules, I'm Doing What's Right! : Although the New Republic Senate denied the military permission to liberate Kashyyyk while peace talks were ongoing with the Empire, when Ackbar learned the Imperial fleet guarding the planet was bombarding it after Han led a successful rebellion on the ground he joins Leia and Wedge in taking a small task force to stop them. Spared by the Adaptation: In original Legends continuity, Ackbar died of old age 25 years after the Return of the Jedi. He's alive and well in The Force Awakens, which happened 32 years after Return of the Jedi. When he dies in The Last Jedi, it's not as peaceful. The Strategist: He is the best strategist in the Alliance and a major threat to the Empire, something acknowledged by several Imperial officers who respect him. In the films, Ackbar develops the attack strategy against the Death Star II in the Battle of Endor. Supporting Leader: He's one of the Rebel Alliance's military leaders, but only appears about an hour into Return of the Jedi for all but a few minutes worth of scenes. In the books and comics, he often takes on this role as well, leading the fleet while the story's heroes play critical roles. Use Your Head: During the Clone Wars in the final battle against the droid forces that invaded Mon Cala, he head-butted an aquadroid with enough strength to tear off its head. Undying Loyalty: He has absolute faith in Leia, with the two of them almost always siding together on issues. Even when he is forced to reprimand Leia over assigning military resources to look for Han, who had gone missing after resigning his commission, he clearly regrets having to do so and later secretly invites her to a meeting that Mon Mothma purposefully excluded her from. Decades later, Ackbar sends Leia a message of support after her heritage is revealed and immediately agrees to join the Resistance when she founds it. Weird Beard: The small tendrils on his chin resemble a beard. Worthy Opponent: Several Imperial officers, particularly Admiral Rae Sloane and General Jylia Shale, express a lot of respect for Ackbar. They even refer to him as Grand Admiral, which is an Imperial only rank, as a sign of respect. "Rogue One... May the Force be with you." A Mon Calamari that served as an admiral in the Rebel Alliance. He commanded a Rebel fleet stationed at Yavin 4 and led the Rebel assault on Scarif during the battle to steal the Death Star plans. Action Politician: Raddus was the mayor of the polar city of Nycullum. When the Empire began their occupation of the planet, he lead his citizens in a planetary exodus using the city's buildings (actually disguised starcruisers) and converted City Hall into his flagship the Profundity. During Rogue One, he is one of the few who advocates for action in the mission for the Death Star plans, and he later coerces the Alliance into the fight by going out with fighters against the majority rule on the strategy. Raddus: You know, Commander, I almost hope they don't. The Captain: He commands a MC75 cruiser called the Profundity. He's one of the elder members of the Alliance, 65 years old when we see him in Rogue One, but he is the one who brings the entire Alliance into action by defying the Council and entering the unlikely fight to aid the rogue squad in their mission. He's also shown to be a skilled commander with some brilliant tactical ideas, and his actions are key to the Death Star plans being able to transmit out of the Scarif archives and into the hands of the Rebels. Due to the Dead: Intones a grave "may the Force be with you'' to honor Rogue One as the Death Star's superlaser strikes Scarif and closes his eyes in grief. Emotional Bruiser: He is deeply moved by Rogue One's sacrifice. Expy: According to behind-the-scenes material, Raddus was based on Winston Churchill and George S. Patton. 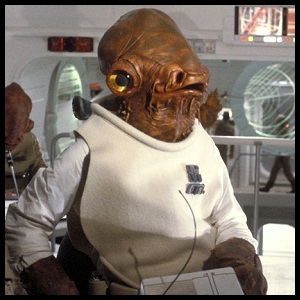 Fish People: Like Ackbar, his species, the Mon Calamari, are fish-like Humanoid Aliens. His skin is of different color compared to Ackbar because he comes from the polar region of Mon Cala. Foil: To Ackbar. Both had major disagreements with each other during the Rebellion, as Raddus' aggressive nature and improvisational tactics rankled the more cautious and traditional Ackbar. Four-Star Badass: A tough-as-nails admiral who is not afraid to take the fight straight to the Empire despite them having much superior forces and a world-destroying superweapon. Frontline General: Raddus is personally present at the Battle of Scarif on his command ship. Heroic Sacrifice: He and his own flagship do one when supporting Rogue One's Suicide Mission from space against superior Imperial forces. The flagship and most of its crew (including Raddus) are lost to the Empire, but the plans of the Death Star are successfully stolen by the Rebellion. Indy Ploy: Orders a Hammerhead corvette to ram a disabled Star Destroyer so it can subsequently crush the other destroyer beside it, leaving a massive paperweight hurling down on Scarif's shield generator. Killed Offscreen: While most of the Rebel fleet escapes Scarif, Raddus' flagship is disabled by the Devastator and boarded by Darth Vader and his Stormtroopers. Although his fate isn't confirmed in the movie, it's been revealed by Word of God that Raddus was killed shortly before Leia escaped the Scarif system with the Death Star schematics. Named After Somebody Famous: A Resistance ship is named after him, the Raddus, which is seen in The Last Jedi. 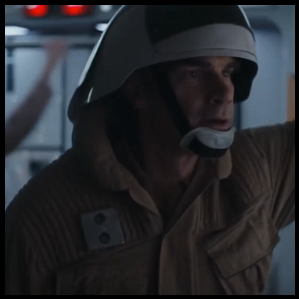 Old Soldier: The admiral is 65 when the Battle of Scarif occurs and has a couple dozen grandchildren before he heads the first real fight against the Empire. One Name Only: His name seems to be just Raddus, which is not too uncommon for Mon Cala. Screw the Rules, I'm Doing What's Right! : When word arrives at Yavin 4 about Rogue One's attack on Scarif, Mon Mothma asks for Admiral Raddus so he can begin preparing the fleet to aid them. Turns out he is already on his flagship and had been preparing to go to Scarif with his own plan to get the Death Star plans despite the Alliance Council's decision. 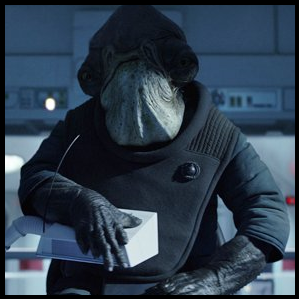 Supporting Leader: Raddus is a supporting character that leads the rebel forces to the rescue of Rogue One during the Battle of Scarif. Worthy Opponent: Tarkin considered him one, noting during the Battle of Mon Cala that he was a crafty tactician and that his defense of the southern hemisphere was "brilliant". "Winning does not mean won." Captain of the Alderaanian frigate Sunspire and a trusted subordinate of Admiral Ackbar. Agate is given command of a small fleet to assault the Imperial forces gathered on Akiva. Her victory at Akiva results in her promotion to Commodore and she is granted command of the Concord. The Captain: Of the Sunspire. After her promotion to Commodore, she is given command of a new Nadiri Mark One Starhawk-class battleship called the Concord. Character Tic: Her hands shake pretty badly during battle due to war nerves and adrenaline, something which she used to try to hide but eventually gave up attempting to do so, reasoning that if her crew sees her overcoming her nerves than that inspires them to do so as well. Commanding Coolness: She is a quick-thinking and highly capable naval officer. She utterly dominates the Imperials in the Battle of Akiva, destroying two Star Destroyers, and her tactics helps several New Republic pilots and allies who had captured prior to the battle break free, which facilitates the capture of two high-ranking Imperials. 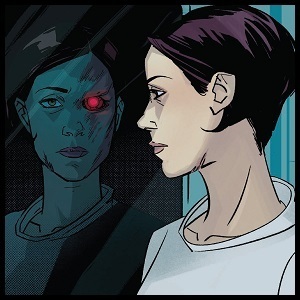 Electronic Eye: Replaces the eye she lost in the Liberation Day massacre with an electronic one that sticks out from the socket and glows red. It has telescopic vision and can display data when Agate closes her other eye. Gut Feeling: When Norra Wexley contacts the New Republic forces during the Battle of Akiva from a TIE fighter and asks for assistance chasing down a shuttle with high-ranking Imperials onboard, Agate is concerned it may be a trap before trusting her gut judgment and ordering fighters to assist Norra. This decision ends up proving to be a good one, with Moff Valco Pandion being killed. Heroic Sacrifice: After her ship gets crippled during the Battle of Jakku, she orders her crew to abandon ship, but she herself stays onboard and uses the ship's tractor beam to make sure the Imperial flagship follows it down to the surface. Rank Up: She is promoted from Commander to Commodore after the Battle of Akiva. Reluctant Warrior: Hates killing, and hopes that the soldiers under her command remember that every time they destroy a Star Destroyer they are also killing thousands of people. Norra: You want us to regret what we've done? Agate: I do. A little. We should. I don't want unrepentant killers, Lieutenant Wexley. I want soldiers who hate what they had to do and fear having to ever do it again. Norra: And if that means we lose the war? Agate: Then we lose the war by keeping ourselves. Two-Faced: A blaster bolt grazes her face during the Liberation Day massacre, burning most of the flesh off on one side, destroying the eye, and damaging her jaw. Nu-skin is grafted onto the burned half, but it looks like plastic and has no signs of aging or other natural marks that come with life, although it is supposed to look natural after Agate has it for awhile. "I will not abandon our command ship." "You and your crew have proven invaluable to our fleet, Captain Syndulla." Commander of the Pelta-class frigate Phoenix Home and leader of a the rebel cell known as Phoenix Squadron that meets with the Ghost crew after they learn of the existence of the wider rebellion. Back on his homeworld of Mykapo, his late brother was a part of Iron Squadron until his death, leaving his son and Sato's nephew Mart behind, though he would soon join the Rebellion alongside his uncle. Sato led Phoenix Squadron in joining the official formation of the Alliance to Restore the Republic. Big Good: Is this to the Phoenix Squadron, being the highest ranking officer on the front lines on a regular basis. Commanding Coolness: "Commander" is his title, after all. He personally leads a number of A-Wings into battle, along with his own frigate, Phoenix Home. After Phoenix Home gets destroyed by Darth Vader, he transfers to the blockade runner Liberator. And after Phoenix Squadron steals a Quasar Fire-class Cruiser-Carrier from the Empire, Sato makes it the new Phoenix Home. He used to have a YT-2400 freighter called Sato's Hammer, which he gave to his brother, who passed it down to his son, Mart. A Day in the Limelight: "Stealth Strike", while mostly about Kanan and Rex working things out during their mission, also revolves around Sato coming to respect Ezra as a competent, valuable ally. Deadpan Snarker: Not too obvious at first, but he has his moments. Ezra: I've been captured many times. Sato: You're not putting my mind at ease. Ezra: Well, I've also escaped many times. In "Stealth Strike", he is willing to venture out into potentially dangerous territory to find out what happened to his men after they mysteriously disappear. Also, during the prison break, he channels Ezra (who he previously had wavering faith in for the entire episode) by encouraging his men that "they've got this". In the comic "A Day's Duty", he is a mentor to Mizel and points out that he needs to act mature if he wants to stay in Phoenix Squadron, since a war-zone is no place for children. When one of the turboblaster batteries takes a hit, he still puts his faith in Mizel to fix it. This carries over to his nephew, Mart. In "Zero Hour", he orders Phoenix Home to evacuate because he's going to destroy Konstantine's Interdictor by ramming Phoenix Home into it. This respect is reciprocated by a couple of his men, who choose to stay with him to help do this. Foreshadowing: His father-son relationship with Mizel in the comics seems to have been foreshadowing that he would have a similar relationship with his nephew, Mart. Going Down with the Ship: He and two other officers stay aboard Phoenix Home to destroy an Interdictor so that Ezra can escape and call for help outside of the Atollon system. Heroic Sacrifice: When the rebel fleet attempts to take down the blockade so that Ezra can escape in the Gauntlet to call for reinforcements outside of Atollon system, Sato realizes that the obstacle in their way is Konstantine's Interdictor. He and a couple of others stay in Phoenix Home to ram it into the Interdictor, destroying it and allowing Ezra to hyperspace-jump away. Hidden Depths: It seems that he knows how to pilot freighters, considering he used to have one of his own and was supposedly the captain of it. Know When to Fold 'Em: Despite his initial reluctance to do so, he and his crew evacuate Phoenix Home in "The Siege of Lothal" when it's clear that its destruction is imminent and escape with their lives. Mysterious Past: Not so much as it is currently seen as a bunch of Noodle Incidents, but he seems to have a criminal background. "Never Far Behind" touches upon this, revealing that when he a younger man, he was a member of a crystal smuggling ring. No One Gets Left Behind: He refuses to leave Mart behind on Mykapo for the Empire, because they're family. Noodle Incident: According to "Gangsters of Galzez", he's been captured by the titular planet's local criminal gang, but managed to outsmart them and escape. Reasonable Authority Figure: Is willing to listen to input and has yet to pull any irrational decisions. Shout-Out: His name is one to film director Jun Fukuda and composer Masaru Sato, who worked together on the Godzilla series, including Filoni's favorite film, Godzilla vs. Mechagodzilla. Star-Crossed Lovers: With Althea, a Sephi princess that he fell in love with while undercover for his criminal group in his youth. Problem was that the locals were xenophobic, and their relationship was strained after Sato was caught stealing crystals and was banished from the world by Althea's father, Lord Hallux. Worthy Opponent: Grand Admiral Thrawn has a lot of respect for Sato, calling him "the best commander to ever come out of the Mykapo system." 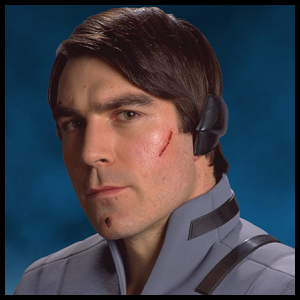 A human male officer stationed aboard the Apailana's Promise. He was given command of the CR90 corvette Thunderstrike after most of its crew was killed by an Imperial infiltration team. The Captain: Of the Thunderstrike, until its destruction at the Battle of Sullust. Commanding Coolness: Is a capable commander with a good sense of humor. Large Ham: He can be a bit overdramatic at times. Chalis: We'll be fine — won't we, Commander? Tohna: More than fine! We'll be majestic! Laughing seahawks diving for prey. Non-Action Guy: Being a navy officer, he does not have much experience in ground combat. He and most of the survivors of the Thunderstrike's crew thus take support roles during the Battle of Sullust after their vessel is shot down. Rank Up: Is promoted to commander of the Thunderstrike after its original captain and most of the bridge crew were killed by Imperials. "The war will go on without me. It won't without you." 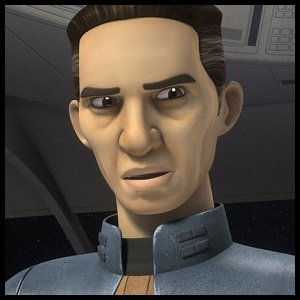 An Alderaanian officer under the command of Bail Organa and later a member of the Rebel Alliance. All There in the Manual: His first name is initially given in the reference guide Ultimate Star Wars. Blatant Lies: At the start of A New Hope, he attempts to convince Darth Vader that the Tantive IV was not a Rebel ship. It did not go well for him. Especially blatant after Rogue One given that Vader himself witnessed the Tantive IV fleeing during the battle of Scarif. The Captain: He is seen commanding two CR90 corvettes during the events of the films: the first is the Sundered Heart and the second is the Tantive IV. Dramatic Irony: During the hyperspace jump away from Scariff to Tatooine, he was preparing to write a letter for his wife and daughters in the event that he would be killed in the line of duty. Not only did he not finish the letter, his family was most likely on Alderaan when the Death Star destroyed it. Face Death with Dignity: Even as Vader was choking him to death and he knew he was going to die, he still held onto hope for Leia and the Rebellion in his last moments. Going Down with the Ship: This trope is discussed in "Raymus", since the Tantive IV was his ship. With the precarious situation the Tantive IV is in following the Battle of Scariff, Raymus knows his chances of survival are slim even before the Devastator attacks them over Tatooine. Heroic Sacrifice: According to his POV story, knowing that his death was imminent, he tried to go out fighting in the hopes of buying Leia time to execute her plan. However, the stormtroopers knocked him out and took him alive, and Vader did the rest. Neck Lift: Darth Vader interrogates him this way during A New Hope, and then chokes Antilles to death when he gets no answers. Number Two: To Bail in Revenge of the Sith, this continues in Ahsoka. Older Than They Look: He appears to have hardly aged much in the nineteen years between Revenge of the Sith and A New Hope. One Steve Limit: Shares a surname with famous Alliance pilot Wedge Antilles, who he is not related to  Wedge is from Corellia, while Raymus is from Alderaan. Antilles is apparently a fairly common last name in the Star Wars universe. Red Shirt: In A New Hope, he gets executed in his first scene. This trope later gets averted due to his subsequent appearances in other films and novels, with him even being the protagonist of his titular short story. Secret Keeper: Knows about the survival of Yoda, Obi-Wan Kenobi, and Ahsoka Tano. Undying Loyalty: Even when being choked to death by Darth Vader, he refuses to betray the Rebellion or the Organa family. The sister of Kaeden Larte. After the Raadan uprising, Miara joined the Alderaan Consular Security force and the Rebel Alliance. After spending time as a pilot, she was promoted to captain and became the leader of an Alderaanian crew. Break the Cutie: The Empire's arrival starts a long line of tragic events for the young girl. Demolitions Expert: She has a surprisingly large amount of knowledge toward explosives. Kid Hero All Grown-Up: After her first appearance in Ahsoka as a fourteen year-old, she returns almost two decades later in "By Whatever Sun" from the From a Certain Point of View anthology book. A Mother to Her Men: After Alderaan's destruction, Miara spends quite a bit of time attempting to comfort her crew, which consisted mostly of native Alderaanians. Secret Keeper: After receiving a mission from Fulcrum, Miara recognized the symbol and realized that Ahsoka was Fulcrum. She kept this a secret from even Kaeden. You Can't Go Home Again: In "By Whatever Sun", after Alderaan is lost to the Empire, Miara remembers Raada and that while she could set foot on Raada again, it was also ruined by the Empire. "Corvette Five locked on target. Prepare for impact." The captain of the Hammerhead-class corvette Lightmaker and its crew. During the Battle of Scarif, Oquoné and part of his crew sacrificed their lives to destroy the Imperial fleet and Shield Gate guarding Scarif. Adaptation Expansion: In the film, Oquoné and his ship go unnamed. In the novelization, those are given along with some more information about Oquoné. Going Down with the Ship: He stays aboard the Lightmaker with a handful of crewmembers to ensure that nothing goes wrong with the ramming maneuver. Heroic Sacrifice: The Alliance would not have had the same chances (read: probably wouldn't have destroyed the Death Star) had the crew of the Lightmaker not rammed those Star Destroyers into the Shield Gate, destroying both Destroyers and taking down the shield around Scarif. Raddus swears to himself that he will name some of his great-grandchildren after Oquoné and his crew for their sacrifice.